One for all: Our silky smooth Eye Crayon Duo can be applied to the entire eyelid as an eyeshadow or just along the edges as an eyeliner. 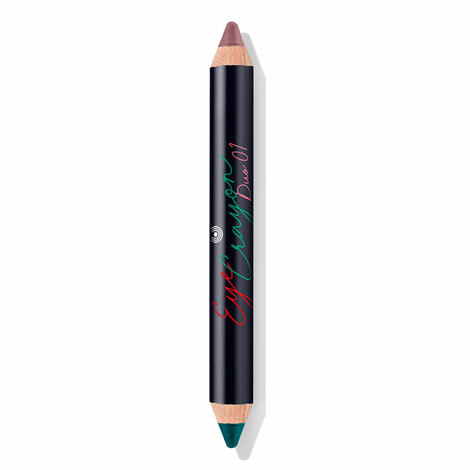 And what’s more, each Eye Crayon Duo features two vibrant, contrasting colours. These eye crayons are perfect for use in combination with Dr. Hauschka Liquid Lip Colour and the new Bronzing Glow Powder. For perfect eye make-up with a flick of the wrist. This dual-colour pencil provides the perfect eye make-up with a simple flick of the wrist. The formulation combines mineral pigments and medicinal plant extracts such as anthyllis with quince wax and shea butter to keep the delicate skin around the eyes soft and supple. Use the kajal pencil to line the upper and lower lids. Apply the eyeshadow to the entire eyelid or use to create individual glossy accents. Apply an initial powdery base to the eyelid for longer-lasting eyeshadow. Ricinus Communis (Castor) Seed Oil, Caprylic/Capric Triglyceride, Glyceryl Ricinoleate, Euphorbia Cerifera (Candelilla) Wax, Beeswax (Cera Alba), Myristyl Myristate, Copernicia Cerifera (Carnauba) Wax, Butyrospermum Parkii (Shea) Butter, Cetyl Alkohol, Silica, Pyrus Cydonia Peel/Fruit Wax, Diatomaceous Earth (Solum Diatomeae), Simmondsia Chinensis (Jojoba) Seed Oil, Anthyllis Vulneraria Extract, Hamamelis Virginiana (Witch Hazel) Bark/Leaf Extract, Camellia Sinensis Leaf Extract, Fragrance (Parfum)*, Citronellol*, Geraniol*, Linalool*, Eugenol*, Tocopherol, Tocopheryl Acetate, Helianthus Annuus (Sunflower) Seed Oil, Glycine Soja (Soybean) Oil, Iron Oxides (CI 77492, CI 77499), Titanium Dioxide (CI 77891), Ultramarines (CI 77007). Ricinus Communis (Castor) Seed Oil, Caprylic/Capric Triglyceride, Mica, Glyceryl Ricinoleate, Euphorbia Cerifera (Candelilla) Wax, Beeswax (Cera Alba), Myristyl Myristate, Copernicia Cerifera (Carnauba) Wax, Butyrospermum Parkii (Shea) Butter, Cetyl Alkohol, Pyrus Cydonia Peel/Fruit Wax, Diatomaceous Earth (Solum Diatomeae), Simmondsia Chinensis (Jojoba) Seed Oil, Anthyllis Vulneraria Extract, Hamamelis Virginiana (Witch Hazel) Bark/Leaf Extract, Camellia Sinensis Leaf Extract, Fragrance (Parfum)*, Citronellol*, Geraniol*, Linalool*, Eugenol*, Tocopherol, Tocopheryl Acetate, Helianthus Annuus (Sunflower) Seed Oil, Glycine Soja (Soybean) Oil, Titanium Dioxide (CI 77891).